Vintage photos are timeless and we all love them. That’s why apps such as Instagram or VSCO have great filters for vintage photo effects; however, your professional photo editing software will give you more room to play. Whether you’re a beginner who’s more comfortable with using Lightroom presets or Photoshop actions or someone who rather adjusts his/her own photos – LAPIXA will show you the best tips and tricks in Lightroom and Photoshop to get vintage effects on your photos! Vintage photos look faded, meaning their colors are less saturated. Plus, their blacks aren’t vivid either, but they rather have red, brown, or blue hues. Grainy or noisy textures make the photo look old as well. Scratches, crumpling, or coffee mug stains and water drops can make for a great vintage effect as well. And the best thing is that all of these vintage photo effects can be added via Photoshop and Lightroom! For both Lightroom and Photoshop, you can get a vintage effect by lowering the saturation of the image (completely if you want your image to be black and white) and/or adding sepia/brown filters to the image. If you want your image to have a certain hue and a matte effect, play with the RGB tone curves. Then, lowering the amount of black pixels in the image by adjusting the “Blacks” and “Shadows” levels in Lightroom or the tone curve in Photoshop. Third, add noise or grain to add texture to your image. Depending on personal taste, add a vignette in black or white. Split toning is a fantastic option for Lightroom users as well. For vintage effects, this means you’re moving your hue slider to the left for warm colors such as yellow, orange or red to the highlights, and cool colors such as blue or green too the shadows by sliding the hue slider to the right. Make this image file a new layer in Photoshop, place it on top of you original photo, and adjust colors, opacity and vignette. You can also choose the blend mode of the layer to be Overlay or Soft Light. Now play with noise and grain to add texture to your image. 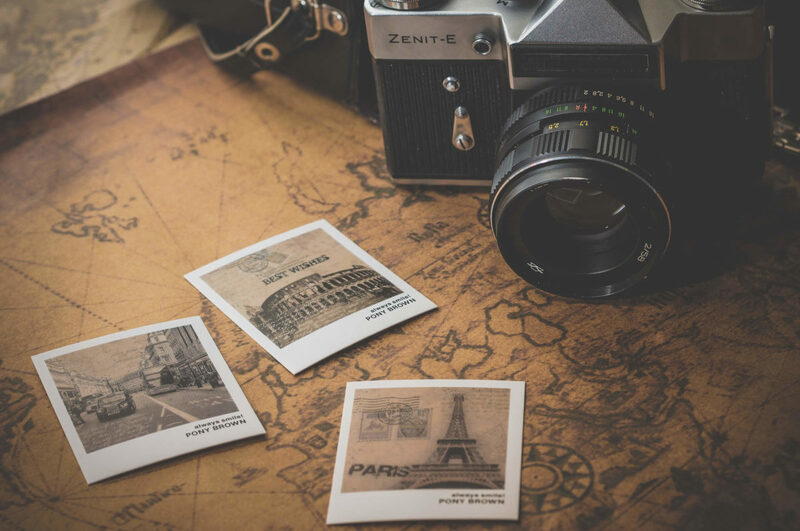 Think about how old photos look: they probably have water spots, coffee (mug) stains, or white spots due to scratches and repeated folding or accidental crumpling. These effects can also be added by working with Photoshop layers. As a beginner, you may want to work with Lightroom presets – that means other people have adjusted sliders in Lightroom for certain (vintage) effects on an image. You can find free presets here or search for the best paid ones online. Often, your favorite Instagrammers – photographers and bloggers alike – will offer presets as well. For Photoshop, the same applies with a different name: Here we have Photoshop actions instead of presets. For 50 free vintage photo effects, try this link.